A man has been charged by police with animal cruelty after an 11 week old puppy was savagely killed. Little Sparky was found dead in a bin in Lurgan after it is claimed he was bludgeoned with a hammer and then microwaved. Police believe the puppy was killed on Saturday between late morning and late afternoon and have asked the public for help. They believe the incident may have been filmed for social media. Tonight police said they have charged a 23-year-old man with causing unnecessary suffering to animals. He is due to appear at Craigavon Magistrates’ Court tomorrow, Wednesday, 7 February. 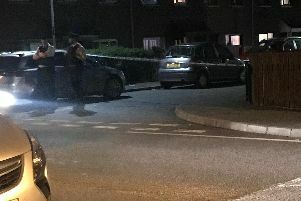 Police said they had recovered a hammer after the incident which happened in the Ailsbury Park area. A police spokesperson said: “There has been suggestions that this was posted on Snapchat or other social media platforms. If you have seen any footage or photographs of the incident (NOT just screen shots of conversations and allegations) then we need to hear from you. “If you happened to screen shot or record any videos that were sent, we need them. That will be the difference between a evidential case and pure hearsay. Whatever happened, it is obvious that little Sparky suffered a horrendous death. We want to get to the bottom of that and make sure that whoever is responsible is held to account. Sinn Fein Cllr Liam Mackle described reports coming from Taghnevan as ‘absolutely shocking’. “The level of depravity that was involved in this alleged incident is shocking. “I have been working alongside a number of agencies in the area, including the residents association, to improve conditions for the entire community. The vast majority of people in the estate are great people. Upper Bann MLA Carla Lockhart called for robust action to deal with animal cruelty. The DUP woman said, “Since news of this incident has come to light there has been condemnation and outrage from across the community. “The community as a whole are shocked that mindless thugs thought it was funny to carry out this depraved act. The message is clear animal cruelty whatever form is not acceptable. It is not a game, nor is it entertainment and those responsible should face the full weight of the law. “Tough sentencing and convictions are important in cases of animal cruelty, however I also would again call for a central register for those convicted of animals cruelty to ensure that those who carry out such acts, are banned from keeping animals. Protection is needed against those who would seek to keep pets and animals, yet may carry out abuse, neglect or cruelty. We need to stamp out animal cruelty and send a message that these acts will not be tolerated in society.